Maryknoll Father Gerard Hammond proudly stands with the North Korean people he serves with love. The following appears courtesy of Maryknoll Magazine, in which it was first published. “There were thousands of refugees at the time. People were starving; there was extreme poverty…. The condition of hospitals was frightful,” he recalled during a recent interview. Since then, Father Hammond, now 83, has cared for all Korean people and developed a loving relationship with them. “As a missionary, it is essential to devote our whole lives — especially minds and hearts and even our physical abilities — to the people we came to serve,” he said. For 30 years, the missioner from West Philadelphia worked as a pastor in the Cheongju Diocese in South Korea, while serving as diocesan vicar general for 20 years. Now the priest, who has been the Maryknoll Society’s regional superior for Korea since 1989, serves tuberculosis patients in North Korea, through the nonprofit Eugene Bell Foundation, which provides humanitarian and medical aid in North Korea. Father Hammond’s hope was to emulate the Maryknoll missioners who served in the northern city of Pyongyang until 1941, but for him to fully minister to the North Korean people, peace and reunification need to arrive in the divided peninsula. The Korean War, which ended in 1953, killed more than 5 million soldiers and civilians and divided the Koreas. Since the war, no Catholic priest or religious sister has lived in the North. 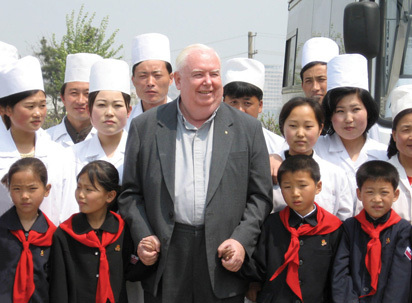 Father Gerard Hammond, M.M., enjoys time with children and workers at Anju City Tuberculosis Center, North Korea. Father Hammond considers his visits to North Korea a pilgrimage because for him the land is sacred ground due to the number of martyrs, including Maryknoll Bishop Patrick Byrne, Maryknoll Sister Agneta Chang, Korean Bishop Hong Yong-ho and many Christians who died for their faith. The focus of Father Hammond’s visits is not to evangelize directly, which the communist government would not allow, but to show compassion and build bridges with people who may not know what a priest is. “We are used to working hamkke, which means ‘with.’ We work together with the local churches,” said Father Hammond, who adds that many Korean priests are engaging in missionary work not only in Asia but also throughout the world. He also has been asked by the archbishop of Seoul to train young Korean seminarians. Father Hammond’s own love for mission was first nurtured by the Sisters of Mercy at Waldron Academy in Merion. Later, he read about the heroic actions of early missioners in the book “Men of Maryknoll” and he sought to join the missionary society when he was 14. Yet he knows that the obstacles to reunification might keep him from seeing his dream of a unified, peaceful and prosperous Korea. 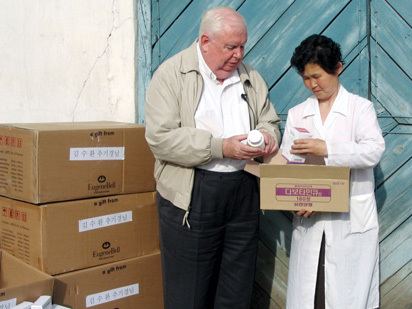 Father Hammond and a nurse check medicine used for distribution to North Korean patients of drug-resistant tuberculosis. In the meantime he continues to tend to those who are weary, tired and sick, especially those affected by tuberculosis in North Korea. This aid is essential because multi-drug-resistant tuberculosis (MDR-TB) is the biggest killer in the country, he says. “All you can do is to share your love and concern for people when they are at their weakest moment, when they have a disease like MDR-TB,” he said. Over the past 20 years the Eugene Bell Foundation has treated about 250,000 patients. The medical aid delegation is allowed to make two three-week visits per year to bring medicines to North Korea. This 12-person delegation — which comprises doctors, nurses and several priests, including missioners from the Paris Foreign Mission Society and Guadalupe Missionaries — tests each new patient to confirm the diagnosis. Father Hammond points out Eugene Bell has cured more than 70 percent of its patients, compared with a worldwide cure rate of only 48 percent. Yet only about 10 percent of the sick in North Korea can be treated by the delegation because of the amount of financial support required for the medicines and equipment, says Father Hammond. He wishes more could be done to relieve people of their pain and suffering. And Father Hammond told The Catholic Korean Catholic Pastoral Information Magazine that one of the most beautiful and emotionally overwhelming moments of a trip is when a patient perseveres in his treatment and is cured. “They’d say quietly, ‘Thank you for giving me hope, for giving me life,’ ” the missioner said. He adds that although he has never met a Catholic directly during his humanitarian visits, he experiences God’s presence in North Korea. Despite the difficulties of going around the North Korean countryside at his age, Father Hammond is not showing signs of slowing down. As he prepares for another trip to care for tuberculosis patients, he says he wants to continue ministering to the people of Korea for as long as he lives.